Discover the natural beauty of Mauritius on this 8-hour private tour that includes a swim in a dolphin habitat. With your guide, visit the viewpoint at Macondé and the cliffs at Gris Gris. See the giant tortoises and crocodiles at La Vanille Réserve des Mascareignes. Pickup and drop-off included. Roll out of bed and enjoy convenient early morning pickup at your hotel around 7:30am. Transfer to the seaside, where you'll board a boat bound for the dolphin habitat. Watch the scenery drift by on the way, then get an orientation from the skipper on what to expect from dolphins. Learn how to behave in the water as not to disturb the dolphins in their natural environment. 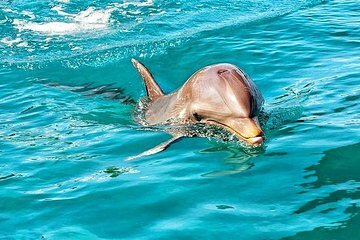 Spend the next 2.5 hours swimming around the dolphins and viewing them from the deck of the boat. If time allows, continue to a nearby popular snorkeling spot called The Aquarium. Back on land, head to Macondé, arguably the island's best viewpoint. Take in the sights and snap photos before heading to La Vanille Réserve des Mascareignes, home to 1,000 giant tortoises and 2,000 Nile crocodiles. Peruse the more than 23,000 species of insects in the insectarium. In the wild south of Mauritius, take the in the rugged scenery and the powerful waves at Gris Gris, where you can see the rock formation known as the La Roche Que Pleure. The tour concludes back at your hotel. Sadly not 2.5 hours in the water with dolphins. the entire boat trip lasted under 2 hrs, with most of the time travelling. Lots of boats with you jumping in for 2 Min swim, then out, race ahead and repeated. +No snorkeling even thou had time. Rest of day was good, great driver and tortoise park was fun. This tour is definitely recommended! The private tour car picks you up at your hotel early in the morning. First we went to Tamarin Bay and from there, took a speed boat of 10 people into the depths of Indian Ocean to chase dolphins. It was an incredible experience to see wild dolphins swim around you in their natural habitat! From there, we went to Crocodile Park, where we saw animals wandering about freely inside a park, which is not like any other animal parks. We saw tortoises in free environment, deers walking around guests. It is a must-see place in Mauritius. We also went to see Gris-Gris, rocks with amazing landscape and waves. It was a tiring day but definitely worth doing. This tour is so recommended!